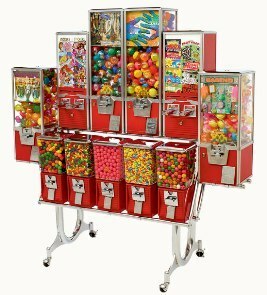 We use the finest bulk vending equipment in the industry, and many of our racks are custom painted for us. Our bulk equipment is merchandised to maximize your profits and increase customer satisfaction. Equipment includes toys, gums, stickers, tattoos, ans small candies. Much of our bulk vending equipment has been special painted for us, and these machines will look great at your store, and no electricity is needed. These type of machines are usually placed near the entrance-exit area of stores. Only a few square feet of floorspace is needed.